Is Google Trying to Block Web 4.0? Contrary to many people’s beliefs, the upper and lower layers have always been inextricably interdependent and nowhere was this more evident than with the birth of the internet out of the flat-rate dial-up networks of the mid to late 1980s (a result of dial-1 equal access). The nascent ISPs that scaled in the 1980s on layer 1-2 data bypass networks were likewise protected by Computers II-III (aka net neutrality) and benefited from competitive (WAN) transport markets. Few realize or accept the genesis of Web 1.0 (W1.0) was the break-up of AT&T in 1983. Officially birthed in 1990 it was an open, 1-way store and forward database lookup platform on which 3 major applications/ecosystems scaled beginning in late 1994 with the advent of the browser: communications (email and messaging), commerce, and text and visual content. Even though everything was narrowband, W1.0 began the inexorable computing collapse back to the core, aka the cloud (4 posts on the computing cycle and relationship to networks). 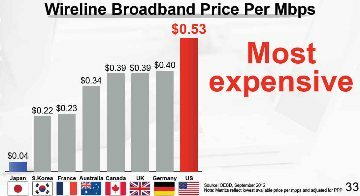 The fact that it was narrowband didn't prevent folks like Mark Cuban and Jeff Bezos from envisioning and selling a broadband future 10 years hence. Regardless, W1.0 started collapsing in 1999 as it ran smack into an analog dial-up brick wall. Google hit the bigtime that year and scaled into the early 2000s by following KISS and freemium business model principles. Ironically, Google’s chief virtue was taking advantage of W1.0’s primary weakness. Web 2.0 grew out of the ashes of W1.0 in 2002-2003. W2.0 both resulted from and fueled the broadband (BB) wars starting in the late 1990s between the cable (offensive) and telephone (defensive) companies. BB penetration reached 40% in 2005, a critical tipping point for the network effect, exactly when YouTube burst on the scene. Importantly, BB (which doesn't have equal access, under the guise of "deregulation") wouldn’t have occurred without W1.0 and the above two forms of equal access in voice and data during the 1980s-90s. W2.0 and BB were mutually dependent, much like the hardware/software Wintel model. BB enabled the web to become rich-media and mostly 2-way and interactive. Rich-media driven blogging, commenting, user generated content and social media started during the W1.0 collapse and began to scale after 2005. Web 3.0 began officially with the iPhone in 2007. The smartphone enabled 7x24 and real-time access and content generation, but it would not have scaled without wifi’s speed, as 3G wireless networks were at best late 1990s era BB speeds and didn’t become geographically ubiquitous until the late 2000s. The combination of wifi (high speeds when stationary) and 3G (connectivity when mobile) was enough though to offset any degradation to user experience. Again, few appreciate or realize that W3.0 resulted from two additional forms of equal access, namely cellular A/B interconnect from the early 1980s (extended to new digital PCS entrants in the mid 1990s) and wifi’s shared spectrum. One can argue that Steve Jobs single-handedly resurrected equal access with his AT&T agreement ensuring agnostic access for applications. Surprisingly, this latter point was not highlighted in Isaacson's excellent biography. Importantly, we would not have had the smartphone revolution were it not for Jobs' equal access efforts. W3.0 proved that real-time, all the time "semi-narrowband" (given the contexts and constraints around the smartphone interface) trumped store and forward "broadband" on the fixed PC for 80% of people’s “web” experience (connectivity and interaction was more important than speed), as PC makers only realized by the late 2000s. Hence the death of the Wintel monopoly, not by government decree, but by market forces 10 years after the first anti-trust attempts. Simultaneously, the cloud became the accepted processing model, coming full circle back to the centralized mainframe model circa 1980 before the PC and slow-speed telephone network led to its relative demise. This circularity further underscores not only the interplay between upper and lower layers but between edge and core in the InfoStack. Importantly, Google acquired Android in 2005, well before W3.0 began as they correctly foresaw that small-screens and mobile data networks would foster the development of applications and attendant ecosystems would intrude on browser usage and its advertising (near) monopoly. Web 4.0 is developing as we speak and no one is driving it and attempting to influence it more with its WAN-side scale than Google. W4.0 will be a full-duplex, 2-way, all-the time, high-definition application driven platform that knows no geographic or market segment boundaries. It will be engaging and interactive on every sensory front; not just those in our immediate presence, but everywhere (aka the internet of things). With Glass, Google is already well on its way to developing and dominating this future ecosystem. With KC Fiber Google is illustrating how it should be priced and what speeds will be necessary. As W4.0 develops the cloud will extend to the edge. Processing will be both centralized and distributed depending on the application and the context. There will be a constant state of flux between layers 1 and 3 (transport and switching), between upper and lower layers, between software and hardware at every boundary point, and between core and edge processing and storage. It will dramatically empower the end-user and change our society more fundamentally than what we’ve witnessed over the past 30 years. Unfortunately, regulators have no gameplan on how to model or develop policy around W4.0. The missing pieces for W4.0 are fiber based and super-high capacity wireless access networks in the lower layers, settlement exchanges in the middle layers, and cross-silo ecosystems in the upper layers. Many of these elements are developing in the market naturally: big data, hetnets, SDN, openflow, open OS' like Android and Mozilla, etc… Google’s strategy appears consistent and well-coordinated to tackle these issues; if not far ahead of others. But its vertically integrated service provider model and stance on net neutrality in KC is in conflict with the principles that so far have led to its success. Google is buying into the vertical monopoly mindset to preserve its profit base instead of teaching regulators and the markets about the virtues of open or equal access across every layer and boundary point (something clearly missing from Tim Wu's and Bob Atkinson's definitions of net neutrality). In the process it is impeding the development of W4.0. Governments could solve this problem by simply conditioning any service provider with access to a public right of way or frequency to equal access in layers 1 and 2; along with a quid pro quo that every user has a right to access unhindered by landlords and local governments within economic and aesthetic reason. (The latter is a bone we can toss all the lawyers who will be looking for new work in the process of simpler regulations.) Google and the entire market will benefit tremendously by this approach. Who will get there first? 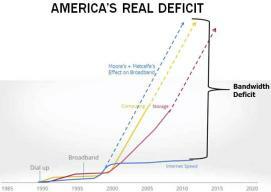 The market (Google or MSFT/AAPL if the latter are truly hungry, visionary and/or desperate) or the FCC? Originally hopeful, I’ve become less sure of the former over the past 12 months. So we may be reliant on the latter. DSL reports thinks Google is within its rights because it expects to offer enterprise service. Only they are not and heretofore had not mentioned it. The datacenter as an "open access" boundary. What happens today in the DC will happen tomorrow elsewhere.